More fuel for my "Belgium 2008" chant I say to myself silently every AM. 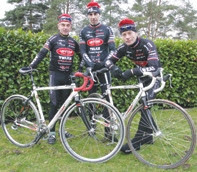 LOCAL riders Barrie Mitchell and Mick Ives took part in the World Masters Cyclo Cross Championships at Mol, near Antwerp in Belgium, last month. Ives, from Baginton, just failed to make history in the event by becoming the first rider to win six World Masters Cyclo Cross titles. He was beaten into silver medal position in the 65+ category by old rival and now five times world champion Herman Martens, three years his junior. Ives had trained very hard to defend his championship and was a clear winner at the recent British Championships, but it is a very different ball game in Belgium, where the cyclo cross is huge and big events often attract 30,000 spectators. The course at Mol, which Ives has raced ten times, is very fast and mainly single track through pine forests, with 500m of road and three big sand sections, some of which is rideable, the rest has to be run. Ives has won the title five times, been second twice and third once. He has also been second three times in the UCI World Road Championships and third once in the UCI World Mountain Bike Championships. MI Racing-EAS-Thule team mate Barrie Mitchell finished eighth in the 60+ category, just three places behind last year's World Champion Vick Barnett. Barrie's race went exactly as expected and for the first time in five years he managed to get round without any crashes or problems. He was happy with 8th, although he was only 15 seconds away from 6th place. "Racing at Mol is very fast and even small time gaps are very hard to close up. Passing is also a problem as a large section of the course through the woods are on single track paths," he said. "As usual the large sections of sand are a problem to the English riders as we have nothing like this in the UK. "You can lose big chunks of time each lap if you are unable to ride through the sand sections. Local Belgians are very good at this as many events in Belgium are centred in sandy areas each weekend." That is an awesome vid Jon! Gracias! Indeed the base began in earnest today before the snows come again. The gym work I've been forced to o actually made me feel great! More base! 8 months till we begin again. The furnace is hot.